Penicilliosis is a rare opportunistic infection seen in immunocompromised individuals with acquired immunodeficiency syndrome, hematological malignancies, or immunosuppressive drugs., The disease is caused by Talaromyces (Penicillium) Marneffei., The disease is endemic in Southeast Asian countries, China, Hong Kong, Indonesia, Thailand, and Vietnam. In the Indian subcontinent, it is limited to the residents of northeastern states or those with the history of travel to Manipur,, Meghalaya, and Mizoram. The fungus causes disseminated disease, which is potentially fatal. Early diagnosis on bone marrow examination and cytology and timely initiation of treatment is lifesaving. We report the first case of T. marneffei in 31-year-old recently diagnosed HIV-infected resident of Delhi with no history of travel to any of the endemic zones in the country or outside. To the best of our knowledge, this is the first published case report of penicilliosis from this part of the country. A 31-year-old male resident of New Delhi, presented with the complaints of a persistent cough, intermittent low-grade fever, and weight loss for the past 5 months. He was on antitubercular treatment for the past 4 months from the region directly observed treatment center for a lymphocyte predominant exudative left-sided pleural effusion with no relief in symptoms. Now, he complained of increasing fatigue, total loss of appetite, and abdominal distension for the past 1 month. The general physical examination revealed mild pallor and mild hepatosplenomegaly. The right submandibular lymph node was palpable, measure 1.2 cm × 1 cm. A complete blood count revealed pancytopenia (hemoglobin - 7.6 g/dl, total leukocyte count - 2400/mm3, and platelet count - 21,000/mm 3). Peripheral blood showed normocytic normochromic red cells, with a differential count of neutrophils - 75%, lymphocytes - 20%, monocytes - 2%, and eosinophils - 3%, along with the presence of few transformed lymphocytes. The patient was diagnosed with HIV 1 infection by ELISA and Western blot with a CD4 count of 17 cells/μl (390–570 cells/μl). Chest X-ray revealed multiple radiopaque densities in bilateral lung fields. Computed tomography scan revealed multiple subcentimetric mediastinal and mesenteric lymphadenopathy. The spleen measured 17.6 cm. There was hepatomegaly along with subcapsular hypodense lesions measuring 13 mm × 12 mm [Figure 1]a and [Figure 1]b. The patient underwent bone marrow aspiration and biopsy. The bone marrow aspirate smears were particulate and normocellular, showed many scattered histiocytes densely packed with the round-to-oval, sausage-shaped organisms of size 2–6 microns, few containing more than 100 parasites [Figure 2]a. These were also seen scattered in the background. There was no granuloma or necrosis. The morphology was consistent with that of T. marneffei. 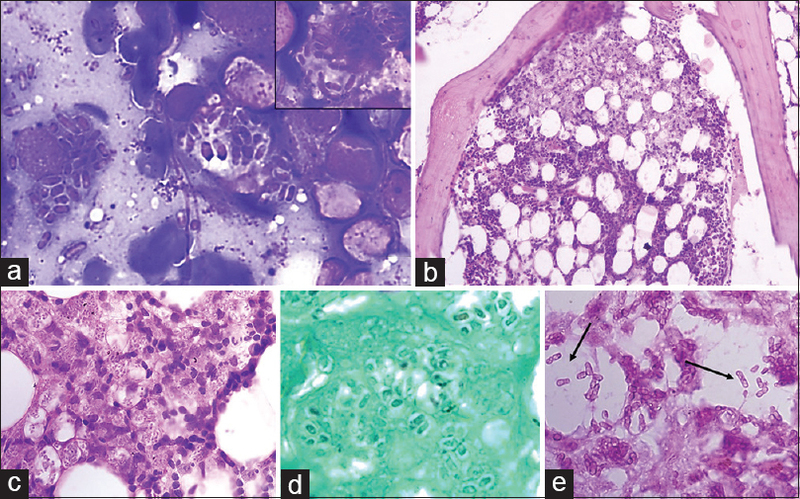 The bone marrow biopsy also showed sheets of histiocytes laden with T. marneffei along with few granulomas [Figure 2]b and [Figure 2]c. There was no necrosis or atypical cells. The transverse septa were better seen on the Gomori-methamine-silver (GMS) and periodic acid–Schiff (PAS) stain of the bone marrow biopsy slides [Figure 2]d and [Figure 2]e. The myeloid and erythroid series was unremarkable. The blood cultures did not show any growth of T. marneffei. Aspiration cytology from the submandibular lymph node showed features of reactive hyperplasia with scattered yeast of T. marneffei. The patient was started on systemic antifungals (liposomal amphotericin B at 4 mg/kg body weight) for a period of 4 weeks followed by life-long fluconazole prophylaxis. Antiretroviral therapy was also started. The patient improved clinically, was healthy on discharge, and kept on regular follow-up. T. marneffei is the only thermally dimorphic fungus endemic in South-East Asian region and China. Recently, Penicillium marneffei has been reclassified in the genus Talaromyces. In these endemic areas, the number of newly infected cases of T. marneffei is about 50,000/year in HIV-positive patient and death in up to 5000 patients annually. The first case series from the Indian subcontinent was of four cases of disseminated penicilliosis in HIV-positive patients in Manipur state by Singh et al. Subsequently, additional 46 cases report from the same area by Ranjana et al. over a period of 19 months confirming its endemicity in this area. Since then, there have been additional case reports of patients either residing in or with the history of travel from adjoining Northeastern states., Sood and Gugnani reported a refugee from Myanmar with the history of residence in Mizoram presenting with T. marneffei infection in Delhi. To the best of our knowledge, this is the first case of T. marneffei infection indigenous to North India and Delhi. T. marneffei is a dimorphic fungus which exists in both the yeast form (at 37°C in the aspiration smears) and as mycelium (at lower temperatures in the culture). The mode of infection is not clear but presumed to be acquired via inhalation leading to pulmonary infection, followed by dissemination to the lymphatic system, liver, spleen, and bones. The common clinical features are fever, weight loss, anemia, hepatosplenomegaly, lymphadenopathy, lung, and skin involvement. The infected tissue shows a variety of reactions, depending on the host immune status, with the formation of granuloma to suppuration and necrosis. In the present case, there was no necrosis or granulomas in the bone marrow or lymph node aspiration smears. The yeast forms resemble the cellular debris because of their small size and shape. Oil immersion examination of slides shows spherical- to sausage-shaped yeast form of size 3–8 μm. The characteristic feature is the presence of transverse septa, which is better delineated on the special stains such as GMS and PAS. The differential diagnosis of the T. marneffei includes Histoplasma, Cryptococcus, Candida, Blastomycosis, Leishmaniasis, Toxoplasma gondii, Pneumocystis, and Calymmatobacterium granulomatis [Table 1]. The diagnosis is usually apparent on morphological examination of aspirate or biopsy smears from the infected tissue, but culture is the gold standard for diagnosis. Bone marrow aspirate material gives the highest yield for culture (about 100%), followed by skin biopsy and blood culture (76%). The time for positive culture is 4–7 days. The untreated penicilliosis has very high mortality rate (100%). The recommended treatment is liposomal amphotericin B, 3–5 mg/kg body weight/day intravenously for 2 weeks, followed by oral itraconazole, 400 mg/day for 10 weeks, followed by secondary prophylaxis. T. marneffei infection is now an emerging infection in immunocompromised patients and in the bone marrow transplant recipients. It is important to recognize the fungus and make a timely diagnosis since the disease is associated with a very high mortality. Ranjana KH, Priyokumar K, Singh TJ, Gupta CC, Sharmila L, Singh PN, et al. Disseminated Penicillium marneffei infection among HIV-infected patients in Manipur State, India. J Infect Dis 2002;45:268-71. Singh PN, Ranjana K, Singh YI, Singh KP, Sharma SS, Kulachandra M, et al. Indigenous disseminated Penicillium marneffei infection in the state of Manipur, India: Report of four autochthonous cases. J Clin Microbiol 1999;37:2699-702. George IA, Sudarsanam TD, Pulimood AB, Mathews MS. Acute abdomen: An unusual presentation of disseminated Penicillium marneffei infection. Indian J Med Microbiol 2008;26:180-2. Michael JS, Abraham OC, Mathai D, Mathews MS. Varied clinical manifestations of Penicillium marneffei in patients with human immunodeficiency virus: A report from South India. Mycoses 2005;48:120-1. Duong TA. Infection due to Penicillium marneffei, an emerging pathogen: Review of 155 reported cases. Clin Infect Dis 1996;23:125-30. Armstrong-James D, Meintjes G, Brown GD. A neglected epidemic: Fungal infections in HIV/AIDS. Trends Microbiol 2014;22:120-7. Sood N, Gugnani HC. Disseminated Penicillium marneffei infection in a Myanmar refugee from Mizoram state. Indian J Pathol Microbiol 2010;53:361-3. Wu TC, Chan JW, Ng CK, Tsang DN, Lee MP, Li PC, et al. Clinical presentations and outcomes of Penicillium marneffei infections: A series from 1994 to 2004. Hong Kong Med J 2008;14:103-9. Wong KF. Marrow penicilliosis: A readily missed diagnosis. Am J Clin Pathol 2010;134:214-8. Sirisanthana T, Supparatpinyo K, Perriens J, Nelson KE. Amphotericin B and itraconazole for treatment of disseminated Penicillium marneffei infection in human immunodeficiency virus-infected patients. Clin Infect Dis 1998;26:1107-10.